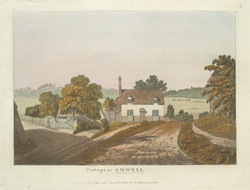 Thought to be an early view by R. M. Batty, of Amwell Cottage in Hertfordshire. The cottage was a relatively large 17th century cottage when this painting was completed however in the 19th century it was rebuilt by William Chadwell Mylne in accordance with his father, Robert Mylne’s wishes to landscape the area around the New River to make it more aesthetically pleasing. It is now considerably larger and is known as Well House.